Gluten is a sticky, stretchable protein found in grains like wheat, barley, oats, and rye. Formed during the kneading process, gluten chains create a matrix that trap carbon dioxide bubbles produced by the fermenting yeast. This gives bread its chewiness, pizza dough its stretchiness, and acts as a thickening agent in dozens of products from salad dressing to soy sauce. Even beer contains a fair amount. Gluten is a relatively new addition to the human diet. For a large portion of our species' evolution, humans subsisted primarily on animal protein supplemented with fruits, vegetables, nuts, and seeds. It wasn't until the start of the Neolithic era—around 9500 BCE—and the transition to agriculture that we began consuming carbohydrates and gluten in the form of grains. In evolutionary terms, we might as well have started yesterday. Just as our teeth are still built for tearing through meat and plants rather than processed flour, our digestive system has not yet fully adapted to adequately handle complex carbohydrates (the same goes for bovine lactose—milk) and lacks the ability to fully break down gluten molecules into its component amino acids. For most people, this is no big deal. Even though the body doesn't fully process the gluten or lactose, no harm comes of it and we're no worse for wear. However for the one in seven Americans that suffers from a sensitivity to gluten, consuming it can lead to severe intestinal distress. And even that discomfort is a walk in the park compared to what happens when someone who suffers from celiac disease—full blown gluten intolerance—eats the stuff. For them, any amount of the protein will trigger a massive autoimmune response within the gut as the body's defenses attack gliadin, a glycoprotein found in gluten. Unfortunately, this response also damages the villi of the small intestine (villi are the tiny structures that absorb nutrients from digesting food) which, if left untreated, can result in symptoms ranging from diarrhea, bloating, and abdominal pain to Irritable Bowel Syndrome (IBS), intestinal ulcers, intestinal cancer, and a host of nutrient deficiencies. Once regarded as an rare digestive malady afflicting maybe 1 in 10,000 people worldwide, celiac disease is now considered one of the most common genetic disorders in the western world by the Center for Celiac Disease Research at the University of Maryland. According to a 2003 study published in the Archives of Internal Medicine celiac disease affects an estimated 1 in 133 people in America alone. Being a hereditary disorder, celiac disease runs in the family. Your chances of being diagnosed with it jump from 1 in 133 to 1 in 39 if a cousin, aunt, or uncle has it; 1 in 22 if a member of your immediate family does. Interestingly, celiac disease is far less common for Americans of African, Hispanic, and Asian descent—just 1 in 236. What's more, this disease has shown a marked propensity to occur in combination with lactose intolerance, as well as with type 1 diabetes. Where there is a disease, there is a marketing opportunity. 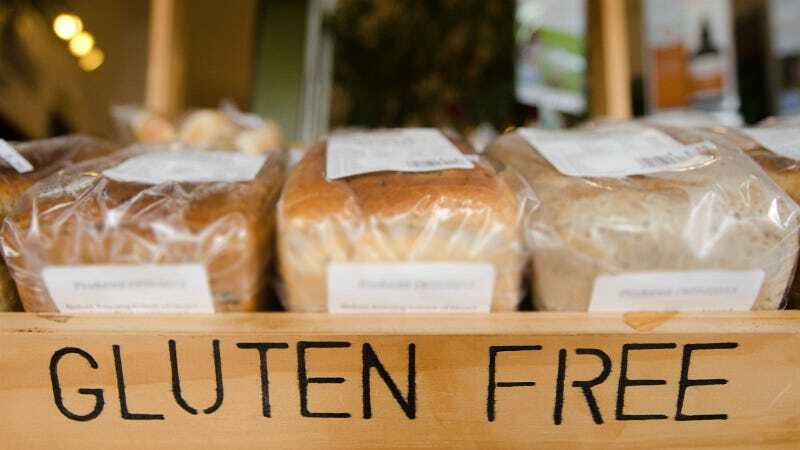 As celiac disease has gained notoriety, an increasing number of people have begun self-diagnosing as gluten sensitive, and consequently have adopted gluten-free lifestyles. It's also been touted as a new-age cure-all for a number of maladies including migraines and fibromyalgia, though there is little scientific data to support such claims. Going gluten-free, unless recommended by a physician, is a bad call according to Carol M. Shilson, executive director of the Center for Celiac Disease Research. "There's no scientific evidence that it's better for you if you don't have celiac disease," Shilson told the Journal Sentinel. In fact, given the difficulty our bodies have digesting gluten as it is, "it's very hard to go back to a regular diet" after any prolonged lapse in its consumption. Heck, just eliminating gluten in the first place is a challenge given its ubiquitous use as a thickening agent. Consequently, much of the weight-loss benefit brought on by giving up gluten is due to the severely restrictive diet one must follow. As Mark DeMeo, M.D., director of gastroenterology and nutrition at the Adult Celiac Disease Program at Rush University Medical Center in Chicago told Women's Health, "there's nothing magical about a gluten-free diet that's going to help you lose weight." In fact, doing so can have the opposite effect. As Shelley Case, R.D., author of Gluten-Free Diet: A Comprehensive Resource Guide and a medical advisory board member for the Celiac Disease Foundation, explained to Women's Health, without gluten to hold baked goods together, food manufacturers will often use fats and sugar instead. That means, Case continued, going gluten-free can potentially increase your risk of developing a micronutrient deficiency, especially if you rely on hyper-processed and fat/sugar-packed, packaged foods rather than the nutritionally stable and vitamin-packed fresh fruits, vegetables, and gluten-free grains (like quinoa) you should be eating anyway. While there is no reliable means of testing for a gluten sensitivity, a simple blood test can determine whether or not someone suffers from celiac disease by identifying specific anti-gluten antibodies.